This auction is for (1) HP 800G1, Elite 8000 8100 8200 8300 Ultra Slim Hard Drive Tray / Caddy. Screws are NOT included with this auction. Trays are pulls from HP Machines Ultra Slim desktop machines. HP P/N: 672365-001 or compatible - THIS IS A GENUINE PART NOT AFTERMARKET OR REPRODUCTION Please verify compatibility prior to purchase. Please note: Offers made on this item are considered based on quantity needed. HP ProLiant DL325 G10. HP ProLiant ML110 G10. HP ProLiant ML350 G10. 1 SAS Tray Caddies. 4 Caddy Mounting Screws. Corresponds to HP Part Numbers. HP 3.5" SAS SATA TRAY WORKING FOR DL385 DL370 DL320 ML350 ML310 G6 G7. DL360p Gen8. BL420c Gen8. BL460c Gen8. BL465c Gen8. BL660c Gen8. WS460c Gen8 Blade Workstation. DL160 Gen8. DL320e Gen8. 4 Screws (hard drive to caddy screws only). Hard drive, and connector are not included. Up for sale is HP 640983-001 Z210 Z220 Z230 Workstation Hard Drive HDD 3.5" Tray/Caddy,Carefully pulled and cleaned. 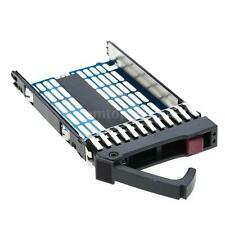 HP 3.5" SAS SATA TRAY WORKING FOR DL180 DL360 DL385 DL370 DL320 ML350 ML310 G6 G7. Solid State Drives. Hard Drives. Asset recovery and recycling services. The truth is out there! Server Parts. Printer Parts. Condition: USED. These caddy are in excellent physical condition. HP ProLiant DL180 G5. HP ProLiant DL180 G6. This 3.5" SAS / SATA Hard Drive Caddy also compatible with HP Part Numbers 335536-001, 373211-001, 373211-002, 349237-B21, 349238-B21, 349239-B21, 389343-001, 432401-001, 454410-001, 454414-001, 461289-001 and 454273-001. 2.5" to 3.5" Drive Adapter tray for hp N54L 651314-001. This adapter can convert any 2.5" SAS/SATA/SSD drive to 3.5" form factor. However, for 2.5" SAS drives, this adapter will change dual port to single port. HP 3TB 7.2K RPM 3.5" SATA Hard Drive Tray. Part Tray Caddy. Interace: SATA. Hard Drives. Spare: 657736-001. Speed: 7,200 RPM. Form Factor: 3.5". SAN Storage. 1 2.5" to 3.5" SATA SSD HDD Adapter (654540-001). 4 2.5" Drive Screws 4 3.5 " Drive Screws. with 4 x 2.5" 4 x 3.5" Drive Screws. This adapter is compatible with all the 3.5" SAS/SATA drive caddie trays from HP, Dell, IBM, or other manufacturers. HP EliteBook 2760p [For 7mm height hard drive only]. 1pcs hard drive caddy. HP Proliant Gen8 servers Note: This tray is compatible with all HP Proliant Gen8 servers that use 3.5" SAS/SATA hotswap drives. HP ProLiant DL 380E G8. HP ProLiant BL420c G8. HP ProLiant DL 388 G8. This adapter can convert any 2.5" SAS/SATA/SSD drive to 3.5" form factor. However, for 2.5" SAS drives, this adapter will change dual port to single port. This is fine for most applications. But if your application requires dual port, this adapter will not work for you. HP Pavilion : DV9000 DV9100 DV9200 DV9300 DV9400 DV9500 DV9600 DV9700 DV9800 DV9900. 1 x HDD CADDY Full kit. Compatible Model Numbers: HP Compaq Presario : V6000 V6100 V6200 V6300 V6400. Give us a chance to make things right for you, and we will do our best to assist you solve the issue. HP Proliant DL580 G5. HP 2.5" Hot Plug SAS SATA SCSI Hard Drive Tray/Caddy for Proliant BL, DL, and ML Servers. 1 x HP 2.5" SAS SATA Tray Caddy 378343-002 DL380 DL360 G6. HP ProLiant DL580 G3. HP Proliant DL360 G5. 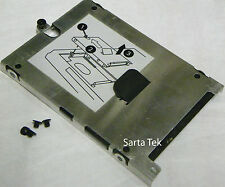 HP Drive Tray Caddy 2.5" Smart G8 G9 SAS SATA 651687-001. Shipped with USPS Mail. 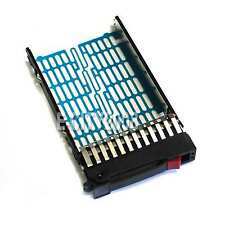 2.5" SAS SATA Tray FOR HP 500223-001 DL380 DL360 DL385 ML370 ML350 570 G6 G7. New Version! HP 2.5" SATA SAS Tray Caddy. 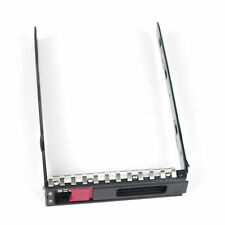 HP 2.5" 500223-001 SAS Tray for Proliant BL, DL, and ML Servers. HP Proliant DL160se G6. Up for sale is 2.5" HP Z230 Hard Drive Tray/Caddy/Rail 727140-001 1B41FWF00-600-G HDD/SSD,Carefully pulled and cleaned. HP SFF 2.5" Hard Drive Tray Caddy 371593-001 DL380 DL360 G5 SATA/SAS HDD. (E.g. you brought wrong size or wrong item). BL480c-G1/G5/G6/G7. Compatibility: HP Workstation Tower Z-Series (Z210, Z220, Z420 etc.). Genuine HP 3.5" Hard Drive Tray Caddy. 2 (Two) Genuine HP 3.5" Hard Drive Caddies. HP Part Number: 640983-001. Warranty covers hardware issues only and excludes problems caused by abuse or tampering with components. Compatible with: HP Z210 Z220 Z230 Z420 Workstation. is what we are striving for. HP ProLiant DL360 G5. HP ProLiant DL360 G4p. HP ProLiant DL120 G7. This 3.5" SAS / SATA Hard Drive Caddy also compatible with HP Part Numbers 335536-001, 373211-001, 373211-002, 349237-B21, 349238-B21, 349239-B21, 389343-001, 432401-001, 454410-001, 454414-001, 461289-001 and 454273-001. This 3.5" SAS / SATA Hard Drive Caddy also compatible with HP Part Numbers 335536-001, 373211-001, 373211-002, 349237-B21, 349238-B21, 349239-B21, 389343-001, 432401-001, 454410-001, 454414-001, 461289-001 and 454273-001. HP SFF 2.5" laptop HDD Drive Tray Caddy 371593-001 DL380 DL370 DL360 G5 G6 G7 SATA/SAS. Pulled from a DL360 G7. Price PER tray/caddy. HP ELITEBOOK 8760W 8770W. HP ELITEBOOK 8560 8570W 8570P;. HP ELITEBOOK 8470P 8470W;. Compatible With: HP ELITEBOOK 8460P 8460W;. HP ELITEBOOK 8560P 8560W;. is what we are striving for. HP Proliant BL460c. HP Proliant DL360 G5. HP Proliant DL360 G4p. HP Proliant DL380 G5. HP Proliant DL380 G4. HP Proliant DL360 G6 . HP 2.5" Hot Plug SAS SATA SCSI Hard Drive Tray/Caddy for Proliant BL, DL, and ML Servers. 2.5 SAS SATA Drive Tray Caddy for HP 378343-002 DL380 DL360 DL580 G6 Hard Disk. HP Proliant DL580 G5. HP Proliant DL360 G6. HP Proliant DL360 G5. HP Proliant DL380 G6. HP ProLiant DL580 G3. HP ProLiant DL580 G4. HP 3.5" SATA SAS HARD DRIVE CADDY FOR ML350 ML370 G6 G7 SYSTEMS (WITH SCREWS). PART # 373211-001. HP 2.5" Hot Plug SAS SATA SCSI Hard Drive Tray/Caddy for Proliant BL, DL, and ML Servers. 1 x HP 2.5" SAS SATA Tray Caddy 378343-002 DL380 DL360 G6. HP Proliant DL160se G6. HP Proliant DL360 G6. HP Proliant DL360 G5. Features:1.Dual-color LED lights display.2.In the case of dual-channel self-adaptive improvements, integrated four-channel high-speed signal enhancement technology, the perfect solution FOR not compatible.The inside of the hem flap with the inside of the bottom flush, so that the hard disk can be fully cooled, about 10 degrees lower than the previous bracket ; extended hard drive life.3. Aluminum alloy material advanced ABS, high wear-resistant carbon black and other wear-resistant; the bottom of the oil technology, coupled with anti-scratch protective film (tearable), better protection hard drive bracket to prevent scratches;4. SATA interface and the thickness of 9.5mm / 12.7mm, in line with the conditions of the computer are applicable;5. 2.5-inch S.
3.5" LFF SAS/SATA Hard Drive Tray Caddy for HP ProLiant G4/G5/G6 DL360 373211-001. HP ProLiant DL360 G5. HP ProLiant DL360 G4p. This 3.5" SAS / SATA Hard Drive Caddy also compatible with HP Part Numbers 335536-001, 373211-001, 373211-002, 349237-B21, 349238-B21, 349239-B21, 389343-001, 432401-001, 454410-001, 454414-001, 461289-001 and 454273-001. 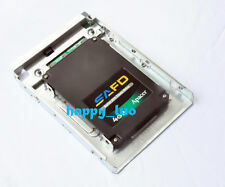 2.5" SATA/SAS HDD Hard Drive Tray Caddy for HP SFF DL380 370 DL360 G5 371593-001. 1 x 2.5" SATA/SAS HDD Hard Drive Tray Caddy. Otherwise deal is final. We will be happy to resolve any issues you may have in a cordial and friendly manner. QTY 1 - HP DL360 / DL380 2.5" Blank Filler. Products may show signs of normal wear and tear and may have missing parts, undiagnosed errors, blemishes, scratches, nicks or other deficiencies that do not interfere with the normal operation of the product. B : Mostly looks clean but you may notice visible scratches or minor wear on certain area(spot) fyi:(Most of computer components like CPU, RAM or motherboard belong to this grade). A- : Overall nice and clean. 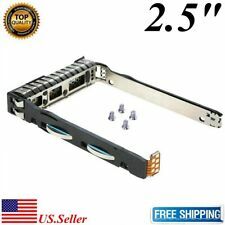 HP 2.5" SAS SATA TRAY . Caddy for HP Z420 2x 2.5" Drive Trays. Compatibility Z420. Device Type Hard Drive Bay Caddy Fits 2x 2.5" HDDs. HP 660542-001 Hard Drive Bay. Hard Drives. Part Number: 660542-001. RAID Cards. Graphics Cards. Hp elitebook 8760W 8770W. hp elitebook 8560 8570W 8570P;. hp elitebook 8470P 8470W;. Compatible With: hp elitebook 8460P 8460W;. hp elitebook 8560P 8560W;. Note: Due to the difference between different monitors, the picture may not reflect the actual color of the item. The item exteriors may have minor scratches, scuffs, dents, cracks, nicks, etc. Local pickup is available. 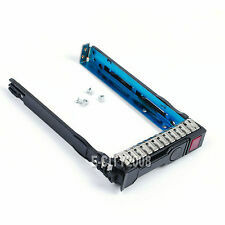 2.5" SAS SATA HDD Hard Drive Tray Caddy Screw for HP DL380 G7. HP ProLiant BL2x220c G7 Server series. HP ProLiant BL460c G7 Server series. HP ProLiant BL465c G7 Server series. HP ProLiant BL490c G7 Server series. HP Part Number:578006-001 / S1-578006 / S2-578006. Product Details. When you're trying to mount a SATA, IDE, or solid-state drive into your Hewlett-Packard machine, you often have to screw the drive into the drive rack. In most situations, this can be very inconvenient, especially if you'll need to remove the drive from time to time, which is why the HP hard drive caddy is so useful. With one of these HP drive trays, you can simply pinch two tabs or switch a lever to slide the tray in and out of its housing. What types of machines can you find hard drive trays? Not only is it common to find a hard drive tray in a desktop, but you can also find these in servers as well, which makes a lot of sense because server techs need to remove hard drives from these machines at a fairly common rate. Additionally, drive trays are also designed with specific server hardware in mind, so if you are running an HP server, you'll need a tray with a connector for their specific servers. Do these hard drive tray models come in different sizes? HP 2.5 drive caddy: This is specifically designed to accommodate 2.5-inch drives, which can include SATA, IDE, and SSD drives. HP 3.5 drive caddy: If you're planning on using a traditional hard drive for your Hewlett-Packard machine, then you'll need a drive tray that can accommodate it. A 3.5 HP hard drive tray can fit 3.5-inch drives of any type. Do all HP hard drive caddies have connectors? No, while some HP ProLiant generation 9 hard drive caddy models have a connector at the end to interface with HP hardware, not all are designed this way. In fact, HP hard drive caddy models just serve as racks that allow you to slide the tray in and out comfortably. These trays simply allow you to elicit data transfers via the IDE or SATA connector of the drive. Interestingly enough, in some cases there's no screwing in for these drives - the sides have protrusions that will connect with the holes in the side of the drive. What computing applications can a drive tray be used for? Easy drive swap-outs in a server environment. As a means to switch out media drives in a standard home PC. As a means to fit a smaller 2.5-inch mSATA solid-state drive into a 3.5-inch mounting bay. Content provided for informational purposes only. eBay is not affiliated with or endorsed by Hewlett-Packard.